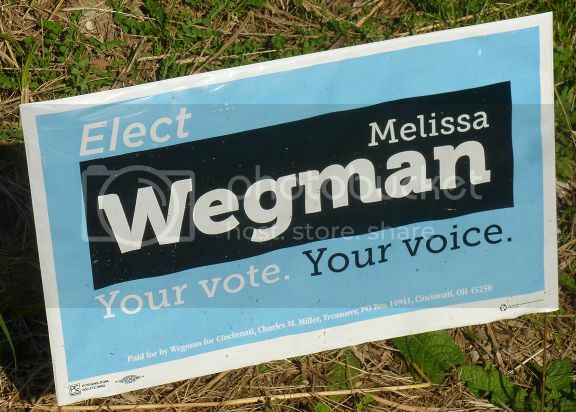 I noticed something about the campaign yard signs as I was walking our dog the other night in our quiet neighborhood of Cheviot, Ohio. None of them were red. This may not seem odd until you realize that Cheviot is in the heart of a district which Republican Steve Chabot won by 70,000 votes in 2012. 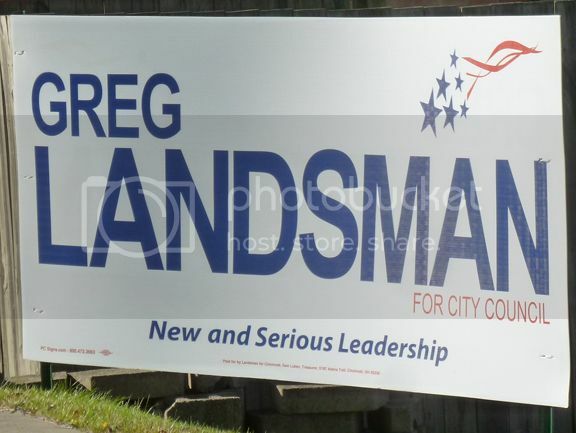 There was no way all the candidates here could be Democrats. Could they? What was going on? 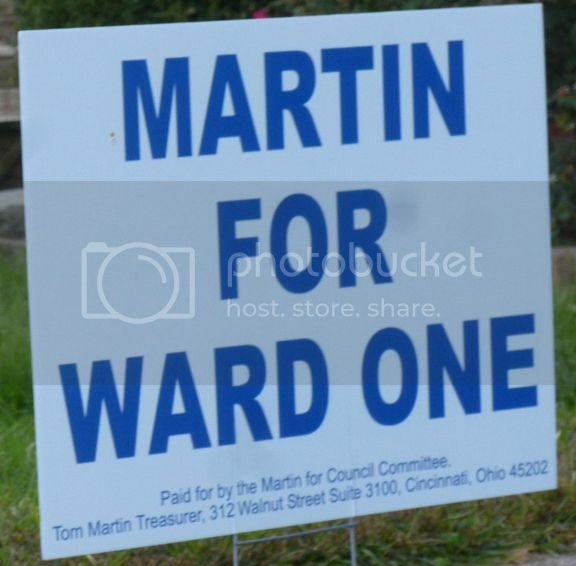 My curiosity led me to the following informal survey of campaign signs in Southern Ohio. 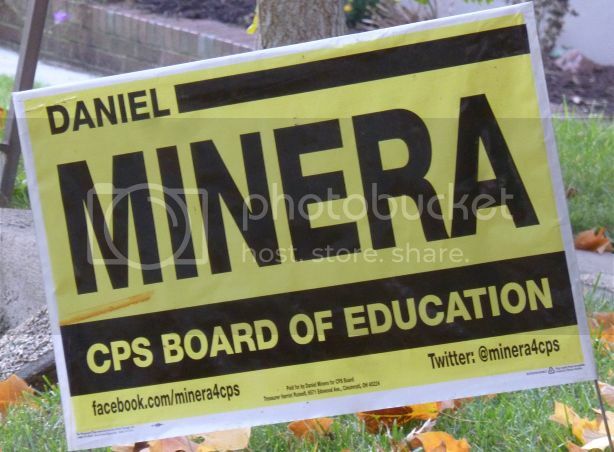 My rules for the study were simple: I would take a picture of every unique campaign sign I saw. No exceptions. 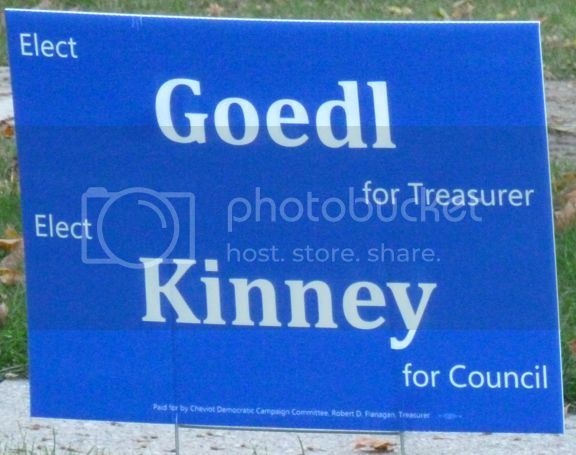 After taking the pictures, I’d look up the candidates and their affiliations. Without further ado, here’s the results. Here’s what I saw on my initial walk in Cheviot. 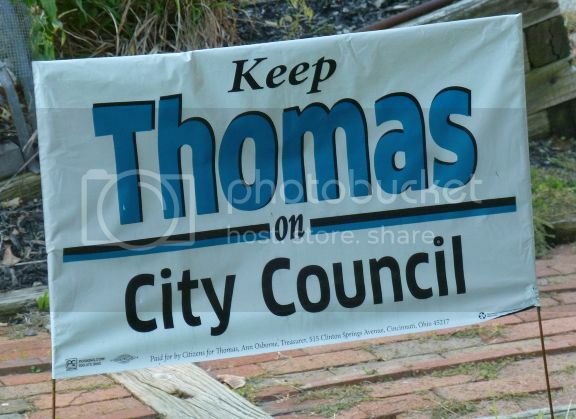 James Martin (R) and Katherine Kinney (D) are both running for Cheviot Ward 1 Council representative. 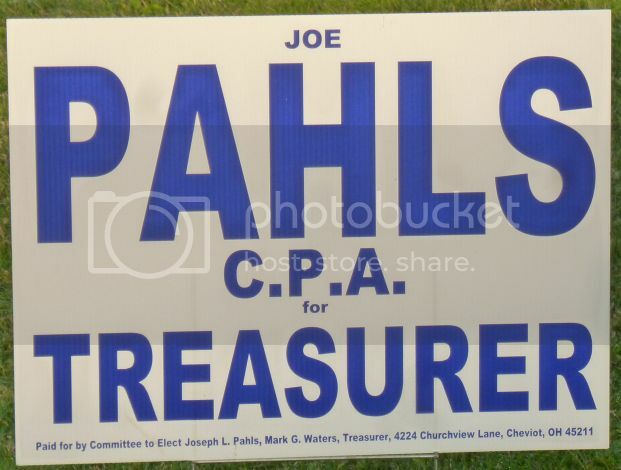 David Goedl (D) and Joe Pahls (R) are running for Treasurer of Cheviot. 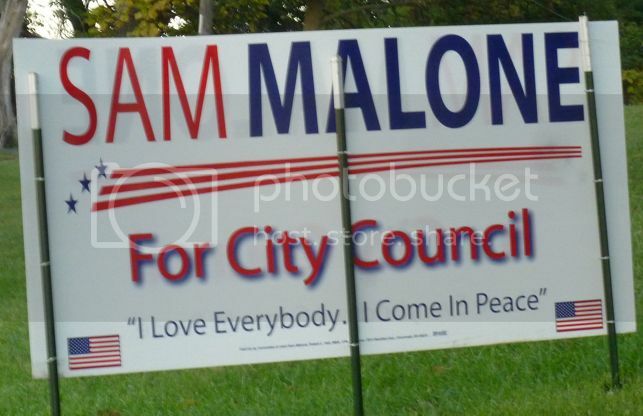 These signs were by far the most prevalent in Cheviot. 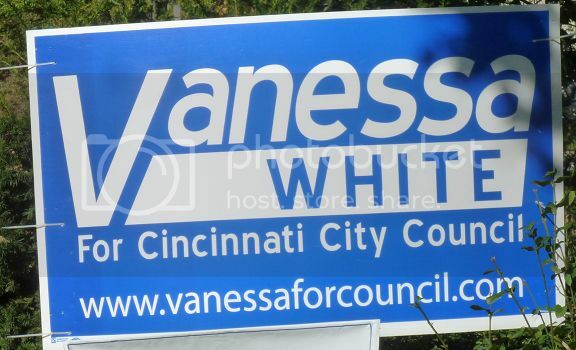 The Democratic signs were white lettering on a blue background while the Republican signs were both blue lettering on white. 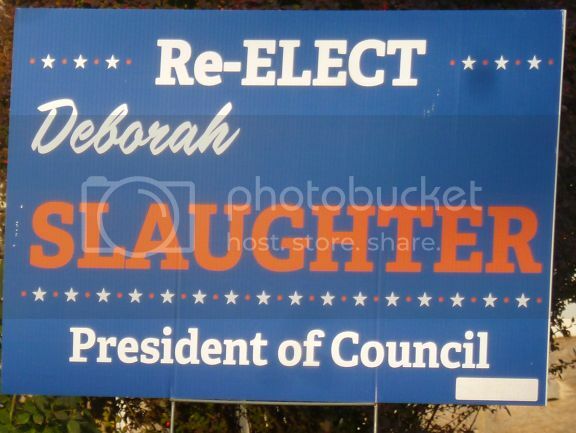 Deborah Slaughter is running for President of the Cheviot city council. I believe Debbie is a Republican but it was uncertain from Internet searches. What I do know is that there was a big controversy involving a local charity painting Debbie’s house. 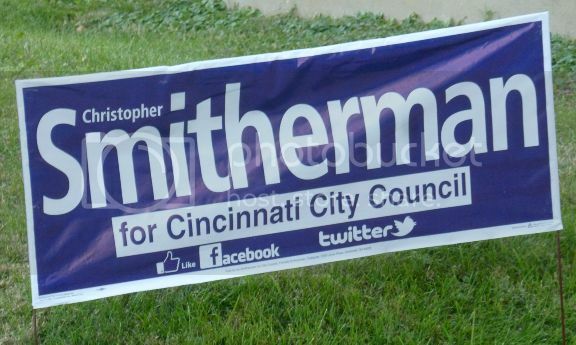 Pam Thomas (D) is running for Cincinnati city council. 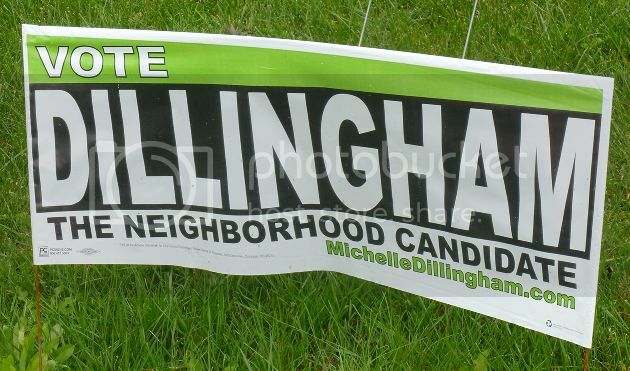 We can’t vote for her because Cheviot is outside of the city voting but we border the neighborhood of Westwood which is within city limits. 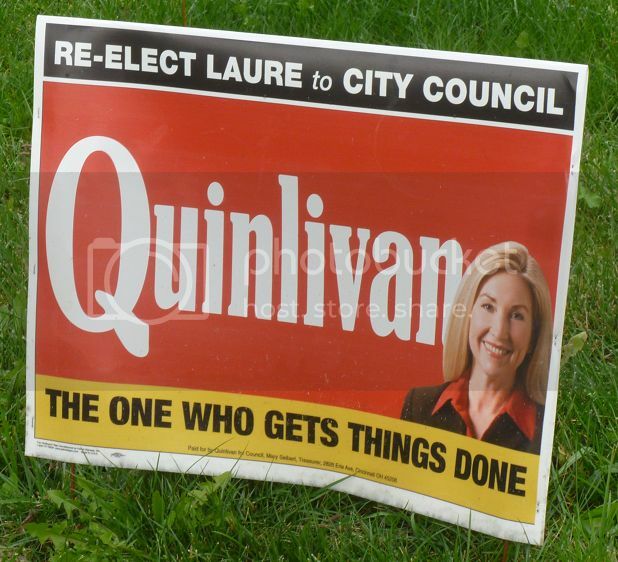 So we see some city council signs. Especially on the main roads. 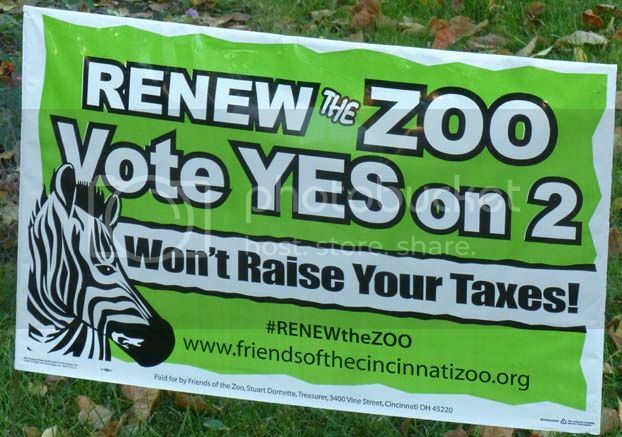 Renewing the zoo levy was in green. Then finally a red sign. But it wasn’t for a Republican. It was to renew a library levy. Is this really Cheviot? I expanded my walk to see if I could find more and finally I ran into a sign which was more what I thought I’d see. Not paying for garbage. 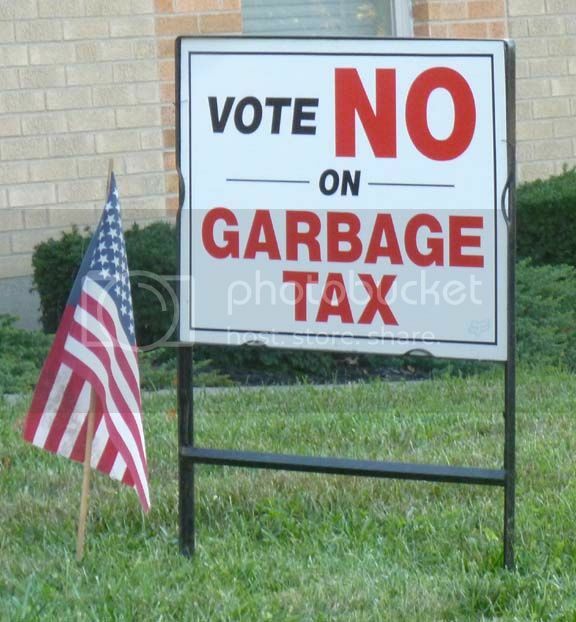 Now that’s a strong red Republican sign. Where the blue signs repeated frequently (both Democrat & Republican versions) I could only find one of these red anti-tax signs. This made me curious. 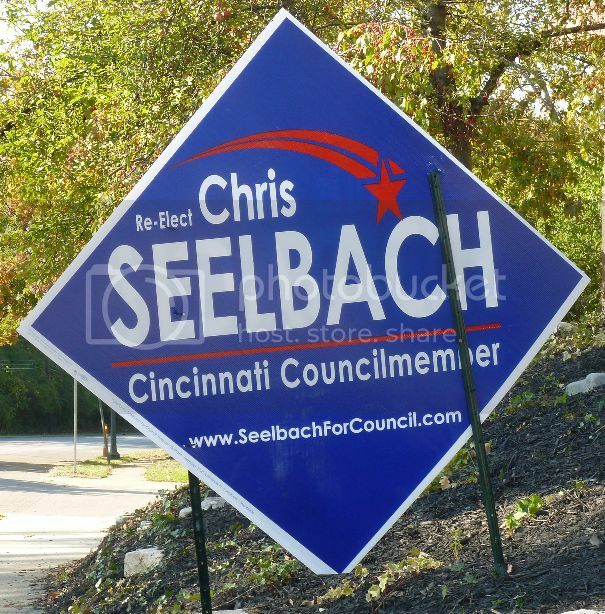 Would red show up elsewhere in the Cincinnati area? My first thought was to look at the city of Cincinnati. But it wouldn’t surprise me if there was more blue in the city because it skews Democratic (see below). More interestingly, what would the landscape look like in West Chester? 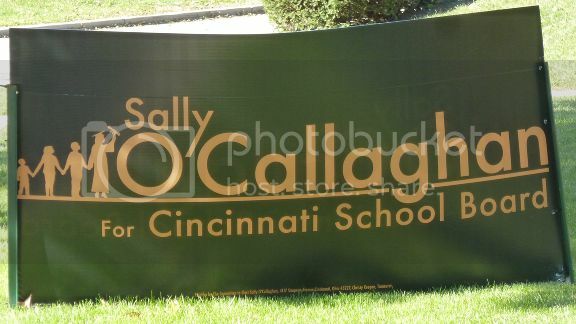 West Chester is about as Republican as you get in Cincinnati. 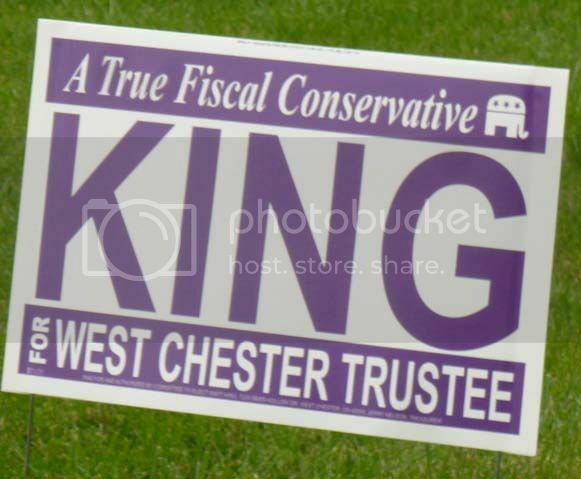 The big race going on in West Chester is for West Chester Township Trustee. Two incumbents (Catherine Stoker (R) and Lee Wong (R)) are up against two Tea Party challenges (Mark Welch (R) and Matthew King (R)). Now this was more like it. Republican vs. Republican. It should be a sea of red. 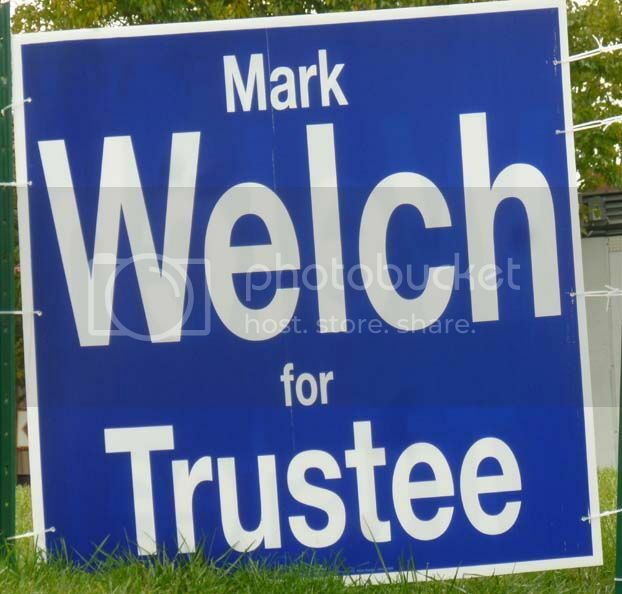 The first sign I came upon was Mark Welch’s. Solid Democratic blue. Matthew King’s was in purple. 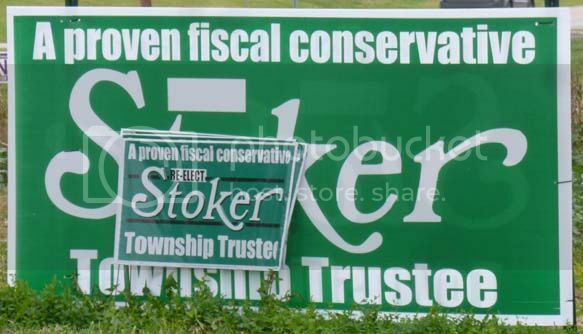 He claims to be a strong fiscal conservative. In purple. 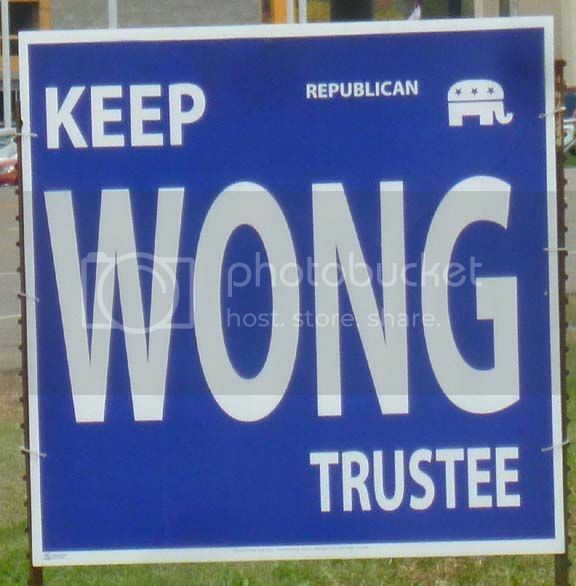 Lee Wong’s was in Democratic blue as well. Interesting. At least he added the Republican elephant. And Catherine Stoker’s in green. Another proven fiscal conservative. In green. This was really surprising. 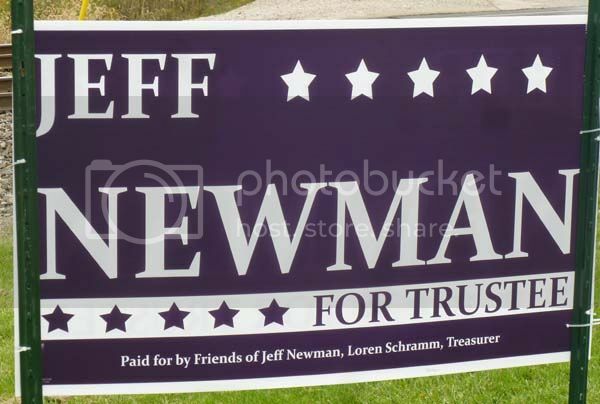 No red from the trustee race. 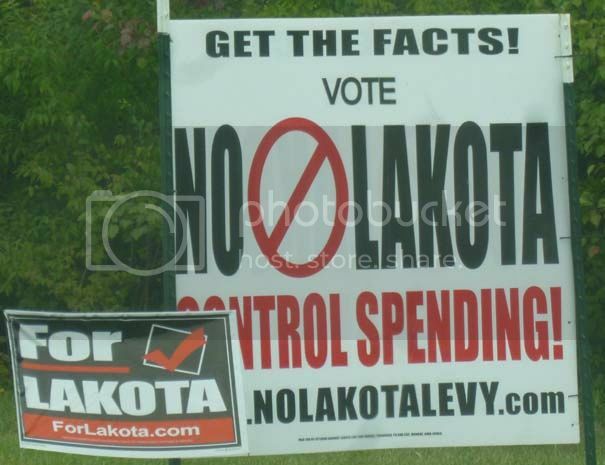 Not even from the Tea Party challengers. 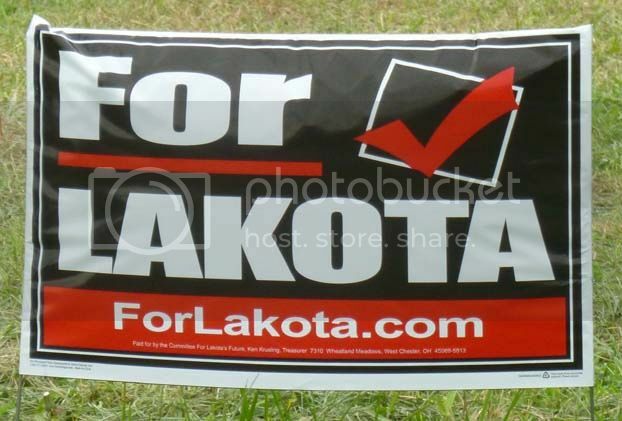 In fact, the most red I saw in West Chester was for the Lakota School levy. 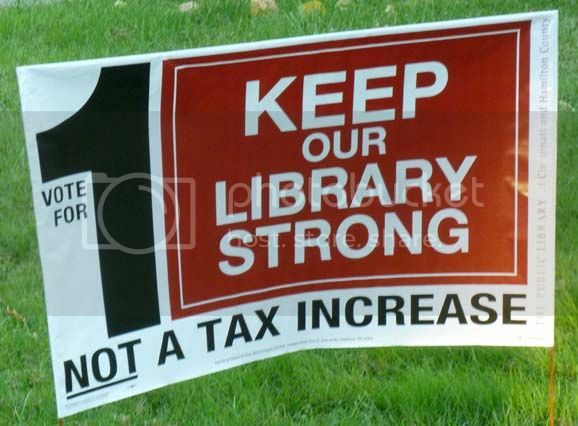 Both for and against signs were black, white, and red with the pro-levy signs outnumbering the anti-levy signs by about 2 to 1. 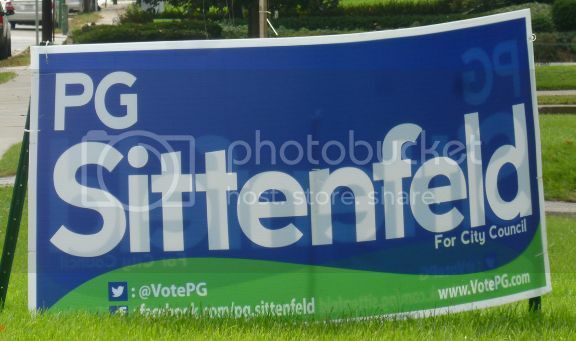 In the spirit of showing all of the signs I saw, here are a couple others seen in West Chester. 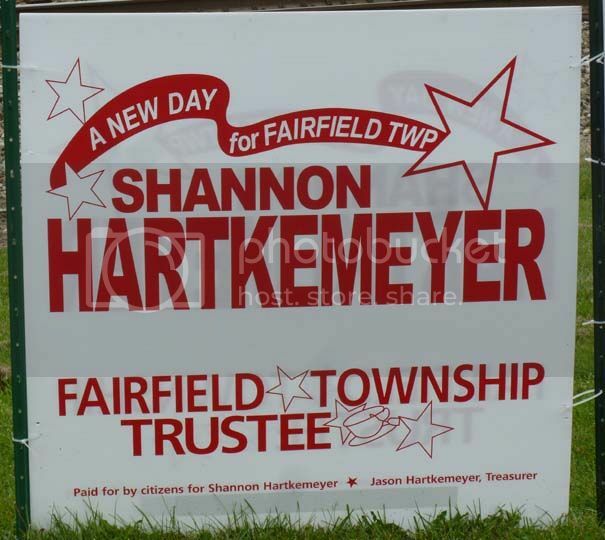 Jeff Newman is a Republican candidate for Liberty Township trustee and Shannon Hartkemeyer is a candidate for Fairfield Township Trustee. Finally, a Republican in Republican red! Keep in mind this is anecdotal evidence. Still, for whatever reason, purple seems to be the new red in West Chester. It’s probably too small a sample to draw any real conclusions. Yet my guess is that Republicans don’t want to advertise too much that they’re Republicans lately. Or at least they seem to be trying to soften their image a little after the shutdown. What are you seeing where you live? Here’s the results from Cincinnati. 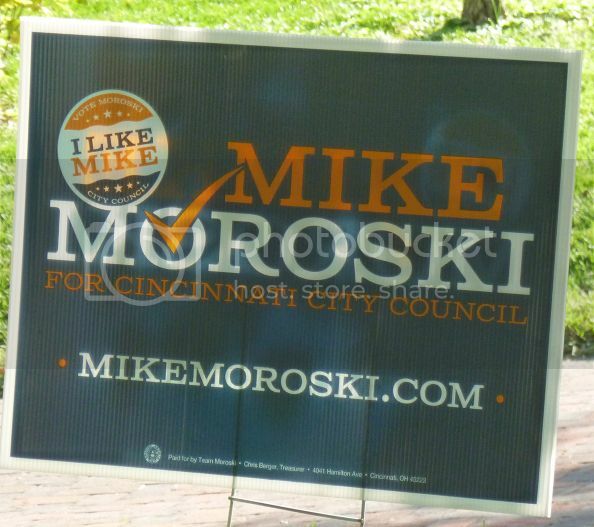 Again, perhaps not as interesting as the more conservative Cheviot or West Chester because even conservative Republicans are going to play down their Republican-ness. 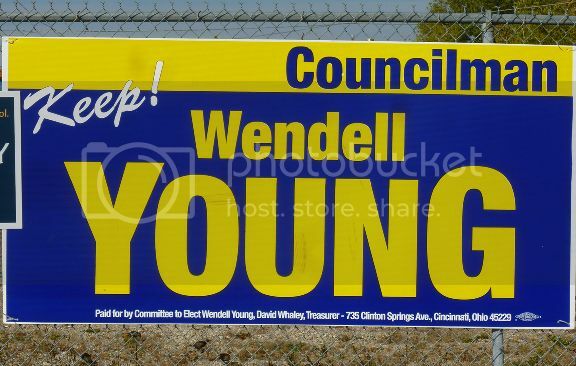 21 people are running for 9 spots on Cincinnati City Council. Here are the 17 signs I could find. First, the Republicans: Amy Murray, Charlie Winburn, Melissa Wegman and Sam Malone. 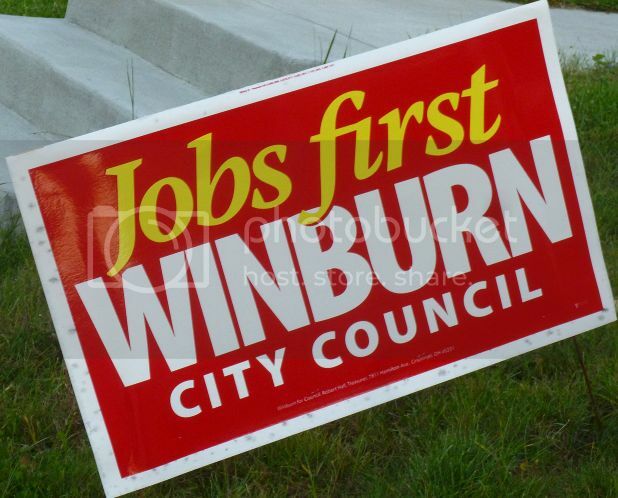 Only Charlie Winburn used a red which would make Republicans proud. 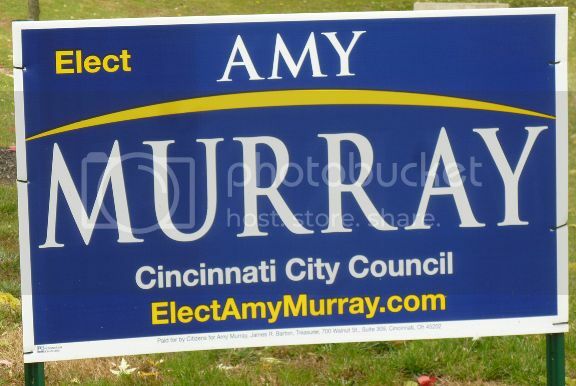 Now Cincinnati itself, like many urban cities, votes largely Democratic within the city proper. Many more conservative candidates run as Independents. 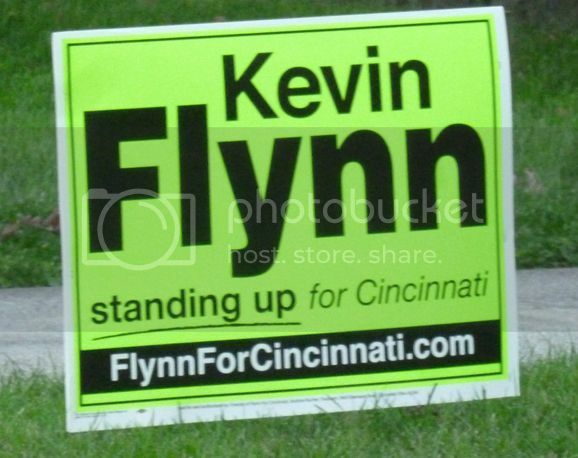 Flynn and White are both technically members of Cincinnati’s Charter Party. The Independents won’t touch Republican red. Then finally the Democrats. 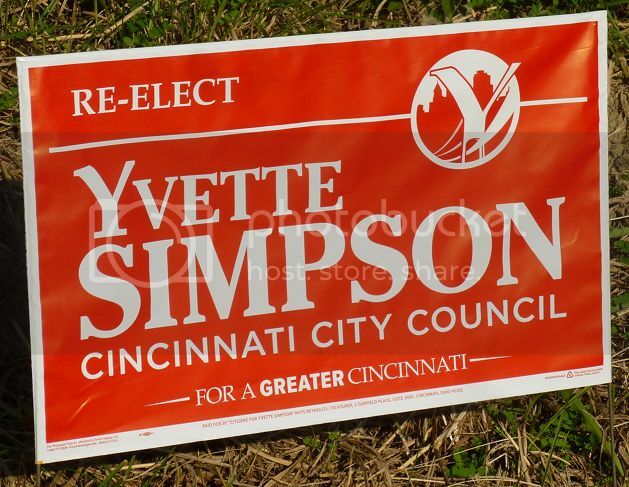 Interestingly enough, Yvette Simpson and Laure Quinlivan, both Democrats, have the most Republican looking signs. 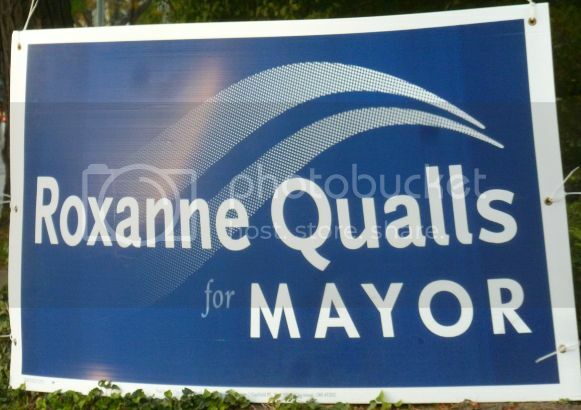 Now I didn’t expect the mayoral race to be any different because two Democrats are running. 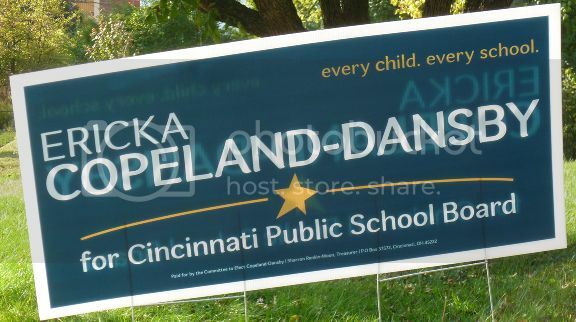 What about Cincinnati Public Schools? 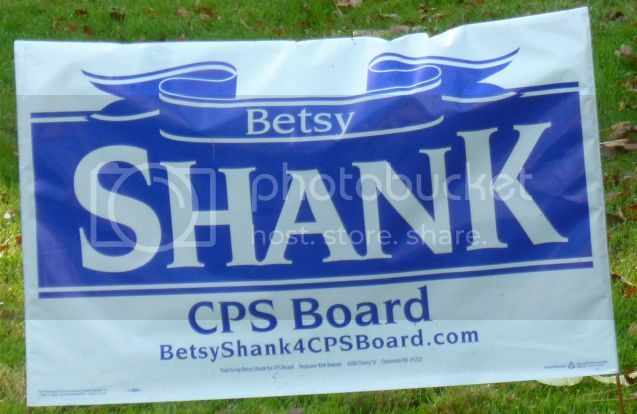 Candidates for the CPS Board run as non-partisan candidates but are often endorsed and supported various groups. None of the candidates this year are endorsed by the Republican Party. 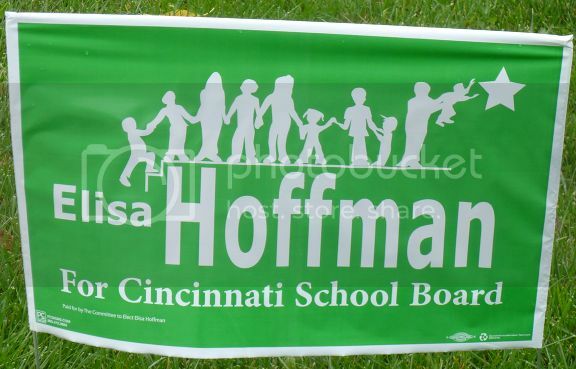 Not surprisingly, school board candidates avoided red. 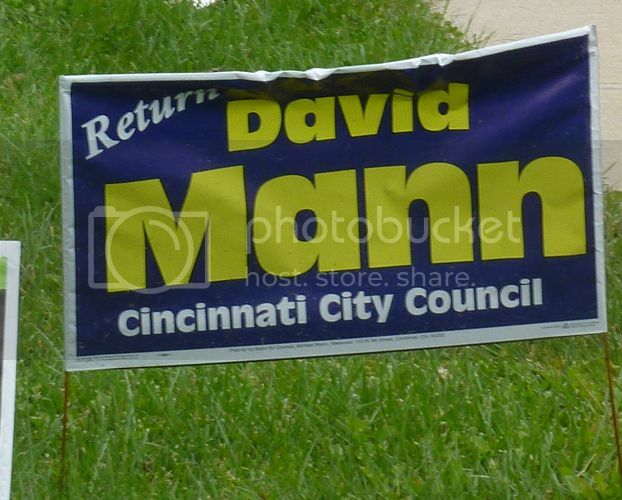 This completes my anecdotal survey of campaign signs in Cheviot, West Chester, and Cincinnati. What does the campaign landscape look like where you’re at? Cross posted at: Daily Kos.